Stanleys Concession borders the Moremi Game Reserve, and is located on the southern tip of Chief’s Island. This private community concession is by definition in a seasonal delta and the floodwaters usually arrive around June. The game viewing is thrilling. Water crossings are part of the adventure and watching zebra standing belly-deep grazing is a sight to see! There is the opportunity to venture out after dark on night game drives to see the nocturnal animals that live here including bush baby, hyena and leopard. Guests can also explore the bush on foot with a walking safari. This wonderful concession is also home to the non-profit charity Living With Elephants which invite you to explore Africa from an elephant’s perspective. Here, you will meet and interact with Jabu, Thembi and Morula, a trio of semi-habituated orphaned elephants, while walking in their gigantic and silent footsteps though the African wilderness. Exclusive to guests at Baines’ Camp and Stanley’s Camp, this is a truly uplifting experience. 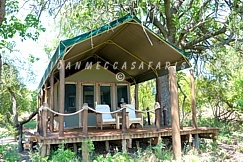 Baines Camp is located on a vast private concession bordering the Moremi Game Reserve in the Okavango Delta. 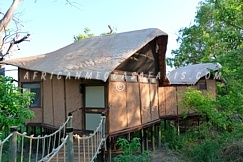 Named after the 19th century explorer and painter Thomas Baines, this is a small camp with just five suites. An eco-friendly property, Baines Camp was built using only commercially grown wood, with over 150,000 recycled aluminum cans incorporated within the walls to provide insulation. Stanley's Camp is the home of the unique elephant interaction activity in partnership with the Living with Elephants foundation. The camp is built on a 260,000 acre private concession in the renowned Okavango Delta and is centred around a large sitting and dining area which affords magnificent views over the floodplains.